It has been some time since I last did an article at P2P-Banking.com on lending volumes. 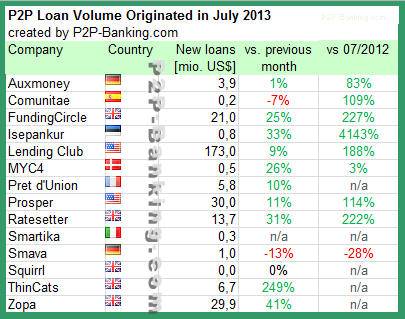 I do monitor development of p2p lending figures for many markets. Since I already have most of the data on file I can publish statistics on the monthly loan originations for selected p2p lending services. July was another month of rapid growth. As the table shows p2p volumes originated grew strongly for nearly all services when compared to the last month or last years month. Note that volumes have been converted from local currency to US$ for the sake of comparision. Some figures are estimates/approximations.